The Worcester Art Museum is currently accepting applications to the New Docent Training Program! Please contact the Docent Program Manager to receive an application. Email Martha Chiarchiaro marthachiarchiaro@worcesterart.org or call 508-793-4341. The word docent comes from the Latin word docere, to teach. Worcester Art Museum Docents are people who are above all enthusiastic, empathetic, and social individuals. These devoted volunteers are great lovers of art, whose commitment to sharing that passion comes through with every museum conversation. The WAM docent is a lifelong learner; someone who is restless unless they are learning a new skill or delving into new material. Innovation and change are not something they fear; they welcome it. They facilitate access to information with ease, for the most novice of museum visitor, to fellow museum colleagues, and beyond. WAM docents love people. They enjoy engaging in conversation; they are leaders; they enjoy diversity of thought. WAM Docents are the face of our institution, and create lasting memories for generations of museum guests. 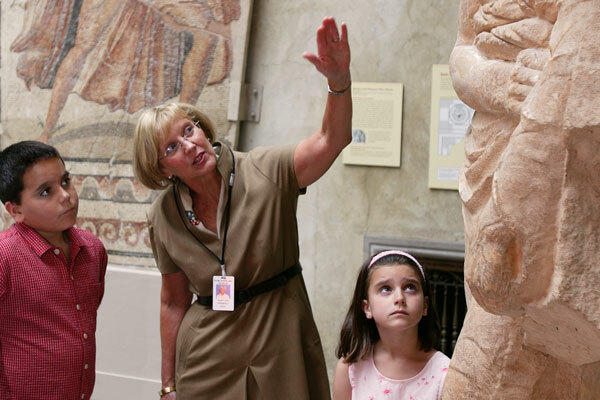 Docents teach in the galleries and broaden the experience of all visitors they meet. They conduct tours of both the Museum's permanent collections and special exhibitions. Tours are both prearranged through the Department of Education and Experience and drop-in public tours. They teach through the Museum's Art Carts. The Museum's interpretation serves audiences of all ages, abilities, and interests. The Museum provides an intensive 10-month training program for persons selected to become docents. This training program takes place one day a week. People interested in applying for a docent training class must be willing to commit to at least two years of active tour-giving beyond the docent training program. Click on the “New Docent Application” link above to access the application for the program. The Museum is committed to the continuing education of its docents beyond the initial training. Docents attend a formal program of continuing education, 9:00 – 11am, the first Thursday of each month, from September through May. The program includes both lectures, demonstrations, and gallery talks by museum professionals and scholars, and is designed to inform docents of topics related to special exhibitions, the permanent collection, and essential skills as communicators/teachers to the museum public. A variety of tour opportunities exist within the docent program including school tours, general interest tours, tours of special exhibitions, weekend public tours, specialized tours of the month, tours in collaboration with school partnerships, museum special events, and many others. On average, 18-20,000 visitors experience the Museum on docent-led tours each year.